On 10 May, 1996, two climbing teams were poised to scale the summit of Mount Everest from the south. One was from the aptly named outfit Mountain Madness. After watching the formidable movie Everest (Universal), which dramatises events leading up to and during that fateful day – when eight lives were lost – viewers may wonder whether some form of insanity isn’t a prerequisite for attempting such a dangerous, punishing feat. Many elite mountaineers, like other extreme athletes, would probably admit to being half-crazy. At a minimum, they would acknowledge that their determination to ascend the world’s tallest peaks is not primarily rational. Climbing fatalities are fairly common in the Himalayas and other high-altitude ranges. Among the factors that differentiated this tragedy: three individuals who succumbed, as well as a number of survivors, paid up to $65,000 for the opportunity. That spring, owing to a boom in adventure tourism, the mountain was overcrowded. In essence, pedestrian traffic jams five miles above sea level helped cause the disaster. Ironically, the man who invented the business of commercial expeditions to the world’s tallest pinnacles, New Zealander Rob Hall (Jason Clarke), owned the second team, Adventure Consultants. Hall and his clients and colleagues are the film’s central characters. They include Texas physician Beck Weathers (Josh Brolin), journalist Jon Krakauer (Michael Kelly) and Japanese alpinist Yasuko Namba (Naoko Mori). Emily Watson portrays base camp manager Helen Wilton; Keira Knightley is Hall’s pregnant wife, Jan; and Jake Gyllenhaal plays Scott Fischer, the freewheeling leader of Mountain Madness. Aided by this terrific ensemble and a first-rate production team, Icelandic director Baltasar Kormakur does an excellent job of conveying the human saga as well as the natural spectacle. The result is both sensitive and powerful. The screenplay by William Nicholson and Simon Beaufoy draws from multiple, often contradictory accounts such as the published memoirs of survivors – Krakauer’s 1997 best-seller Into Thin Air among them – original interviews and several documentaries. Far from glamourising the ordeal, their script shows the effects of exposure to the harshest conditions imaginable and of the delirium that quickly sets in when the human body is oxygen-deprived. The result is a tale of physical pain and suffering that also considers the emotional repercussions of risk-taking. Remarkably, despite the strenuous circumstances and forbidding natural beauty of the surroundings, Everest feels more like a contemplative drama than a wilderness adventure gone awry. And the absence of any genuinely objectionable material – there’s no foul language, sexual innuendo or violence in the film – makes this meditation on humanity’s struggle with the elements suitable for teens as well as grown-ups. When asked why they feel compelled to climb, none of the mountaineers has an answer. But in the often surreal, awe-inspiring images captured by cinematographer Salvatore Totino (shooting in Nepal and Italy’s Dolomite mountains) the mystical pull of the topography can be glimpsed. Everest doesn’t judge anyone; it doesn’t point fingers or assign blame. There are no villains, save for a vicious storm that strikes at the worst possible time. It’s human nature versus Mother Nature. No doubt moral frailty and bad judgment came into play in real life. But the reluctance to mete out cinematic justice is rare and refreshing. Everest does have a moral blind spot, however. It concerns the Sherpa guides and Nepalese people as a whole. Although none perished in this particular incident, scores of Sherpas have died over the years while helping outsiders fulfil their mountaineering ambitions. The movie would have benefited by acknowledging the sacrifices and perspective of a nation that, in addition to being ravaged by natural calamities, has in many respects been exploited by the commercialisation of climbing. 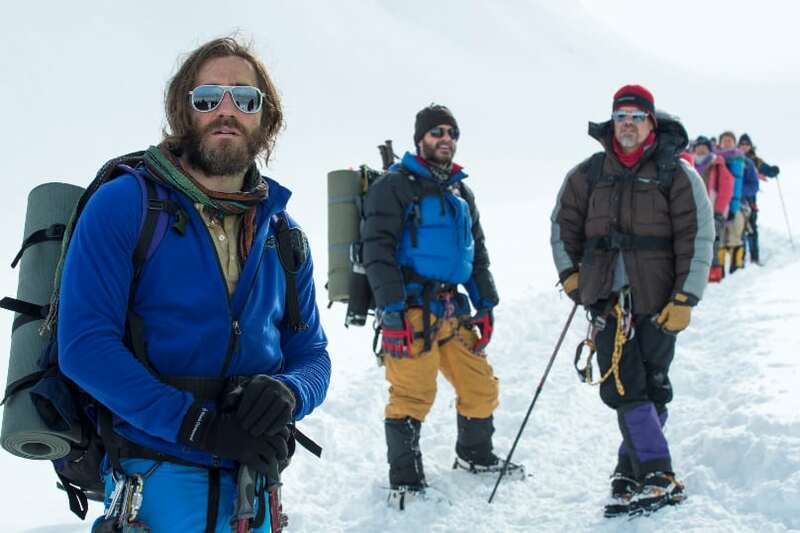 Everest is being released in Imax 3D and on other large-format screens, followed by a release in standard theatres. Because of the predominance of awe-inspiring scenery, the extra cost for 3D viewing is probably justified. The film contains frequent scenes of peril and some gruesome images. Rated M for mature themes.